This month 60,000 bottles from Languedoc will be shipped to Ireland in a 19th-century barque, saving 22,680kg of carbon. Further voyages to Bristol and Manchester in England and even to Canada are planned soon afterwards. The three-mast barque Belem, which was launched in 1896, the last French merchant sailing vessel to be built, will sail into Dublin after a voyage from Bordeaux that should last about four days. Sailing ships are an inherently extremely dangerous form of transportation. Steam power was a revolution in transportation every bit as seminal as the printing press. Sailing vessels being used for cargo in this way are little more than a gimmick, and God help us all if it becomes any more than that. I can see where Toms is coming from, this civilisation is dependent on cheap energy, it enables us to move a lot of mass fast. 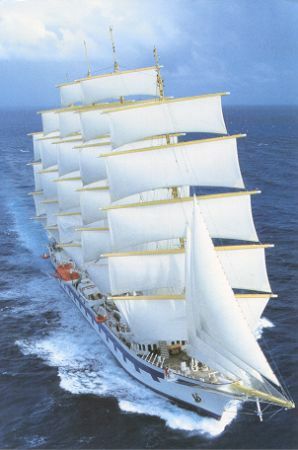 Sailing ships don’t fit into that, even a wind powered system for shifting non-urgent cargo slowly could prove too expensive because the ships just wouldn’t move enough in a year to justify the capital outlay. I suspect that Toms’ view of sail as an extremely dangerous form of transport is true if sail is your only choice. And, if you have only limited knowledge of where you are and what is in front of you. giving them the necessary tools to avoid and get out of trouble. By the way – has anyone heard the outcome of the SS Beluga voyage? I agree that sailing ships are extremely dangerous but it depends on the capt of the ship..and of course it depends on the weather..